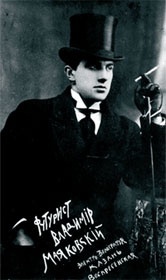 Born on July 19, 1893, in a small Georgian village, Vladimir Mayakovsky is remembered for his contributions to Soviet poetry. Among the foremost representatives of Russian Futurism, he went to considerable lengths to debunk idealistic and romanticized notions of poetry and poets, preferring instead the language of the streets. During the Russian Revolution, much of his poetry called for support of the Bolsheviks, garnering him respect from Communist officials. In 1930, troubled by critics and disappointment in love and politics, he shot himself with a revolver. Stalin, who proclaimed indifference to Mayakovsky’s works a crime, was among those who eulogized the poet. “The poem of the Soviet Passport,” written in 1929, is an example of Mayakovsky’s short, simple, rhythmic lines, which he was known for reciting in stentorian, declamatory style.